Nearly 100 people came out to a West Side church Saturday to hear about Cook County Commissioner Richard Boykin’s proposal to offer free homes in troubled neighborhoods to teachers, police officers and other who commit to livings in those areas. The commissioner’s proposal would convert vacant properties into rehabbed homes that would also be made available to first responders, including firefighters, paramedics and EMTs. Boykin plans to introduce his Neighborhood Revitalization Act at the Cook County Board of Commissioners next meeting, Feb. 8th. “This is a tool that can be used to help stop the violence and bring our communities back,” Boykin told the audience at Home of Life Church, 4640 W. Madison. 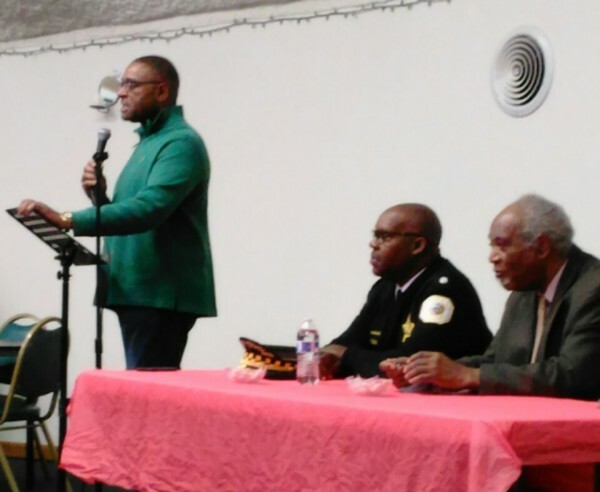 The commissioner hosted a series of “Endangered Population” meetings on the West and South sides last year. Boykin said these communities have some of the highest rates of gun violence, poverty and unemployment in the city. Austin is among the neighborhoods covered in the bill, along with Englewood, East and West Garfield Park, Auburn Gresham and Back of the Yards. Boykin said the goal is to get hard-working people to stay in their neighborhoods, and give those who’ve left an incentive to come back. Constituents, he added, have also said they want police officers and teachers who work in their neighborhoods to live there, too. If approved by the full county board, the program could expand to other endangered communities on the West and South sides, Boykin said, adding that Chicago has thousands of vacant residential properties to tap for the program. The workers have to commit to live in those neighborhoods for five years before they receive a home free and clear, Boykin said. Those properties would be acquired and placed in a newly created “land bank” for development. Boykin said the county would use a portion of commercial property taxes to pay for the program, and that he’s open to including other folks, such as pastors, in the proposal. The commissioner said the program will also make communities safer by ridding areas of blight. Kevin Johnson, Chicago Police commander of the West Side’s 11th District who spoke at the meeting, agrees. The bill also calls for developers to hire 16- to 25-year-olds from those communities on construction projects. Boykin said the county is specifically looking for at-risk youth to be hired. Aaron Mallory, a South Side property developer, said he hires youth directly from the neighborhood for his projects. His organization, called GRO, rehabs distressed properties in Roseland, using high school students to fix up homes. Those students also learn about the real estate business, Mallory said. The Southern Illinois University grad heard about Saturday’s meeting via Facebook, attending to network and get more information. “Our goal is to rehab distressed properties, but we also teach youth these trades,” said Mallory. His 2-year-old organization has rehabbed three homes so far. Mallory said his organization would like to be involved in Boykin’s program if it expands to Roseland. Boykin estimates the program could be up and running in six months once the law takes effect. The Austin Chamber of Commerce and Westside Branch of the NAACP is holding the town hall discussion 6 p.m. Oct. 4 at the North Austin library branch, 5724 W. North Ave.